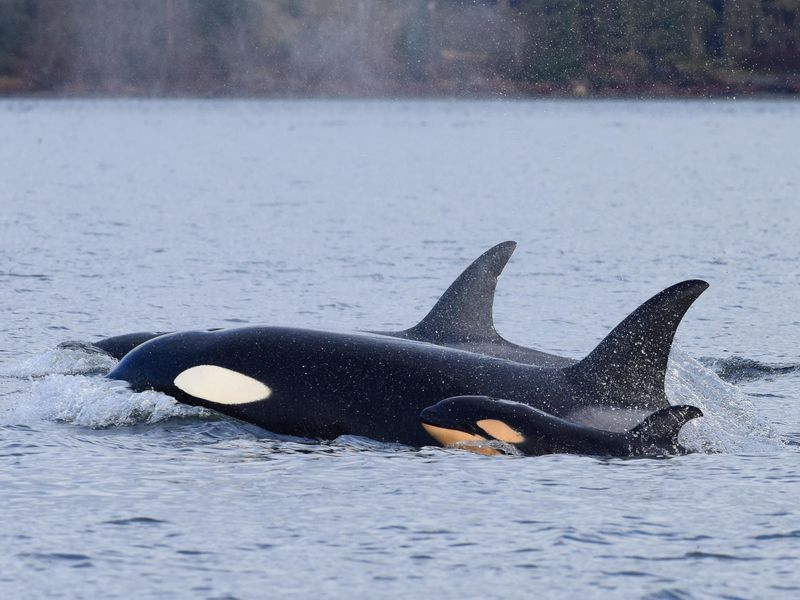 By now, you may have heard about the male transient killer whale who attacked and killed a newborn orca while the baby was swimming next to its mother. Jared Towers, a researcher with Canada’s Department of Fisheries and Oceans, witnessed the killing. He said he was both “horrified and fascinated” by the event, which he described as the first case of infanticide ever reported among killer whales. The incident took place in Canadian waters near the north end of Vancouver Island. Jared told reporter Bethany Lindsey of CBC News that the distressing scene is something that he will never be able to unsee, but he did his best to observe and record the rare incident. This killing of a tiny calf by an unrelated male orca has been troubling me since I first heard about it more than a week ago — and that’s what I told longtime orca researcher Ken Balcomb when I called him on the phone. It wasn’t just the male orca involved. The attacker’s mother also played a role in keeping the mother of the calf at bay and ultimately dragging the dead baby away. In the animal world, infanticide occurs in a myriad of situations among terrestrial species, including lions, rodents and even primates, Jared recounted in a paper published in the journal Scientific Reports. The practice of killing infants of the same species has also been observed in three types of dolphins. The situations are too rare to identify specific causes, Jared noted, but several hypotheses have been put forth. The leading suggestion is that the death of the infant causes the mother to stop lactating and makes her fertile again. That means the attacking male may have a chance to integrate his genes into the population, as opposed to a competing male. Less likely reasons, at least in this situation, involves the goal of reducing the number of mouths to feed when food is scarce for a given population. In some species, an infant may be cannibalized for food. But in this case food is not especially scarce for transients, which eat seals and sea lions. Also, there was no evidence of feeding, such as oil on the water or birds in the air, Jared reported. Killer whales as pathological killers? That’s something to ponder. But, again, there is no evidence to point to a particular cause in this case. I can’t help but wonder if transient killer whales, which eat marine mammals, may be more prone to committing infanticide than resident killer whales, which eat only fish. No doubt the male transient would know the technique for killing an orca calf, which is about the size of a sea lion. Ken Balcomb has observed teeth marks on some of the Southern Resident killer whales, sometimes the result of juveniles playing too rough. On rare occasions, Ken has also observed serious wounds on some whales, including one adult male whose dorsal fin was bent over during an apparent attack by another orca. The size and shape of the teeth marks, known as rakes, provide clues to the size of the attacker. But since nobody sees most of the serious attacks, the cause or behavior leading up to the incidents will never be known. In the recent case, which occurred in December 2016, Jared and his fellow researchers went out to observe a group of transients, whose calls had been picked up on hydrophones. When the researchers got to the area just north of Johnstone Strait, they saw an older female, known as T068, swimming with her 32-year-old son, T068A. The two were following a group of three orcas swimming unusually fast. In that second group was a 13-year-old mother with a 2-year-old calf along with her 3-year-old sister, who exhibited bleeding wounds on her sides and loose flesh on her dorsal fin. About a mile ahead was the 28-year-old mother of the two sisters, T046B, who was accompanied by three young whales, an 8-year-old, a 5-year-old and a newborn. The entire group of related whales came together just before noon near Haddington Island, while the two unrelated whales were about 200 yards behind and still following. The attack apparently began about 20 minutes later with observations of splashing and erratic movements, then the male attacker was seen to move away from the group. The other whales followed. When they all came together, they began circling vigorously. That’s when the researchers caught up with the whales and noticed that the baby was no longer with its mother. The male attacker “swam close past the research boat, and the fluke of the neonate could be seen in his mouth with the body intact trailing underneath his lower jaw,” states the report. The baby’s mother seemed to chase the male attacker, while the attacker’s mother attempted to block her way. “Intense vocal activity could be heard through the hull of the boat, so the hydrophone was deployed,” the report says. “A wide variety of excited discrete and aberrant pulsed calls, whistles, and percussive sounds were recorded…. “At 12:35, (the baby’s mother) rammed (the male) near the surface with sufficient force to cause a noticeable undulation through his body, sending blood and water into the air,” the report says. The event was over about as quickly as it began, with the male carrying away the dead baby. Later the male’s mother was seen carrying the lifeless calf. The larger family group followed the two, staying about 200 yards behind and off to one side. The researchers followed for another hour and a half, when underwater video showed that neither the male nor his mother had the baby. A short time before, they were seen circling as if paying attention to something below them. As darkness fell, the researchers broke off the observations and headed home, but not before noticing that the male had the intact baby in his mouth again, as he and his mother continued on. Jared said it is not surprising that the attacker’s mother assisted her son, “because bonds between maternally related killer whales can be particularly strong.” After all, orca moms are known to help their sons find food and even share food with them. The mother’s bloodline would be continued through her son by the killing, provided that the dead infant was not his offspring and that he could later mate with the baby’s mother. Killer whales are top predators and complex creatures. Their actions cannot always be explained. I remember being surprised to learn that resident orcas occasionally kill harbor porpoises, but they never eat them. See my story in the Encyclopedia of Puget Sound. My discussion with Ken brought me back to the harsh reality of our world. Maybe we can’t fully explain why a male killer whale would attack a newborn of his own kind. But who can explain why a human being would abuse and sometimes kill his own child or take a gun and kill a large number of strangers?